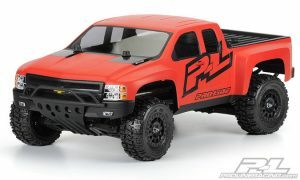 Home » Projects and Builds » Completely Transform Your Slash With Pro-Line Accessories! I still remember when the Traxxas Slash hit the market and completely flipped the world of RC vehicles upside down. Everyone had to have one and the main reason was how scale they looked both on the shelf and while driving. Immediately these classes swarmed race tracks worldwide and the backyard equally. Short course trucks were the thing to run, and even though they handled weird, had no grip, and jumped terribly, they had a special place for every hobbyist. Buuuuut years later what if the magic has worn out slightly? Maybe the short course craze was fun back in the day, but you want to run your Slash out on the beach without it burying itself in the sand in mere seconds. Or you simply fancy a different body style or even something that can handle massive air a little better than the stock Slash setup. I found myself in one of these situations and turned directly to Pro-Line for inspiration and boy was I surprised with the various products readily available. With the Slash being on the market for nearly 10 years by now (holy cow, that long?) the aftermarket is bustling with Pro-Line being at the forefront of this charge. Check out some build ideas I threw together below so you can Transform Your Slash. 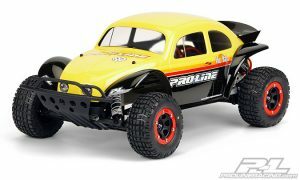 As with most of the builds in this article, my ideas come from browsing Pro-Line’s website for compatible Slash bodies and seeing what clicks. There was one body that sticks out like a sore thumb, and in that case this is a good thing! Right when I saw this body, I knew what this was meant to be. You’ve got to love this Mad Max style post apocalyptic body offering. 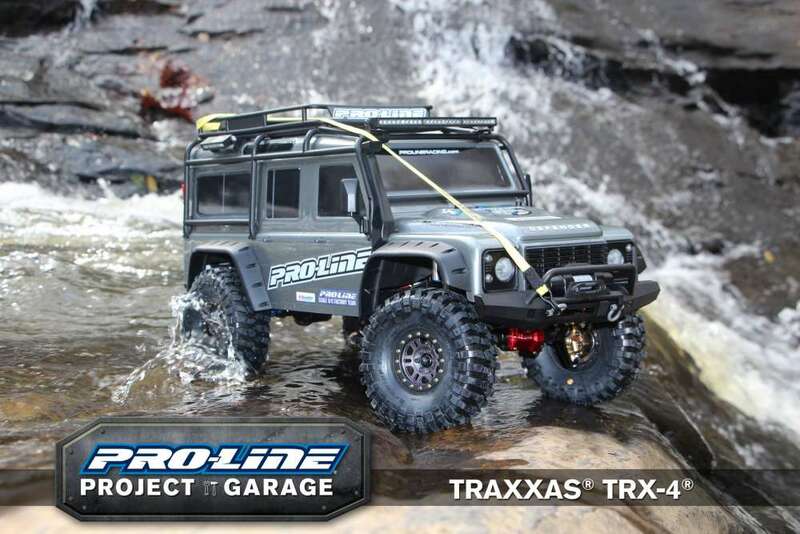 While the body is clear and you will need to up your painting skills, the stock image from Pro-Line shows everything it can be! It offers an insane amount of “scale” details like a large supercharged V8, Spoilers, lights, and a classic 70’s muscle car look. Give it a weathered rust paint job and it looks like something straight out of the movies. 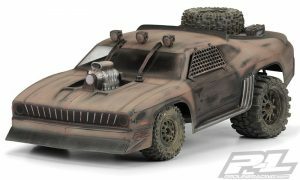 The body is pretty versatile as if you do not want to go for the post apocalyptic look, you can go for the muscle car and keep the wheels and tires smaller. Or you can even go for a rat rod, the possibilities are endless! In order to get the post apocalyptic look on your vehicle, you are going to want to go for a staggered setup. This means the front and rear wheels are different sizes (the rear being decently larger than the front). This gives the car a super aggressive jacked up look that looks menacing and ready to take on anything. 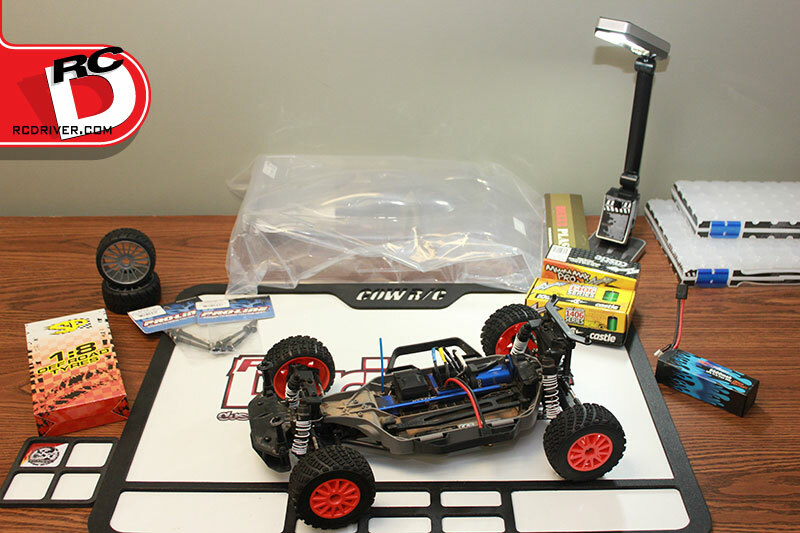 The Pro-Line body is wider than stock so you will need the ProTrac arms to widen the front stance to match (this is done by using standard 2.2” wheels on these arms). For the rear, they recommend bolting on some Stampede or Rustler wheels as both are compatible. 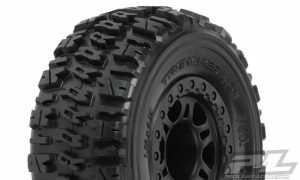 I think to really nail the look, super aggressive looking off road tires would suit the build best and for me those would be the Pro-Line Trenchers. They have these tires both pre mounted on a similar style wheel in both 2.2” and 2.8” so you can get the same look in the front and rear respectively. Lastly, go ahead and bolt on any spare 1/10th scale wheel and tire you have laying around to the body. The more used the better as nothing should be shiny and new on this build! 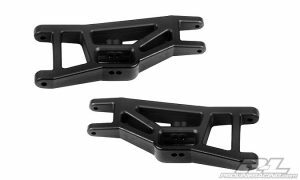 Something completely necessary for this build are the extended front & rear body mounts from Pro-Line. The body will not mount properly without these, so be sure to pick these up. Other than that, this is really your build form here on out. 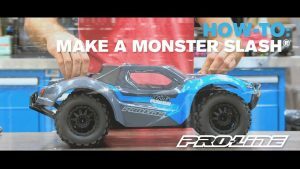 Maybe some extra speed would fit the bill since there is a massive V8 sticking out of the trunk, or you want a nice suspension setup via Pro-Line’s ProTrac suspension kit. I say go for more scale details, hack up the body as much as you can and bolt on as many parts that will fit. The performance off road crawler/desert truck light bar kit would be my recommendation here, you can never have too many lights! This was the very first conversion project I did to my first Slash and I could not be happier with the results. It is so simple of a concept, yet fully transformed my vehicle so much so that if I was handed this conversion I wouldn’t believe that there is a Slash under this body. The motivation was to build one of those awesome dune buggies you see bashing out in the deserts. 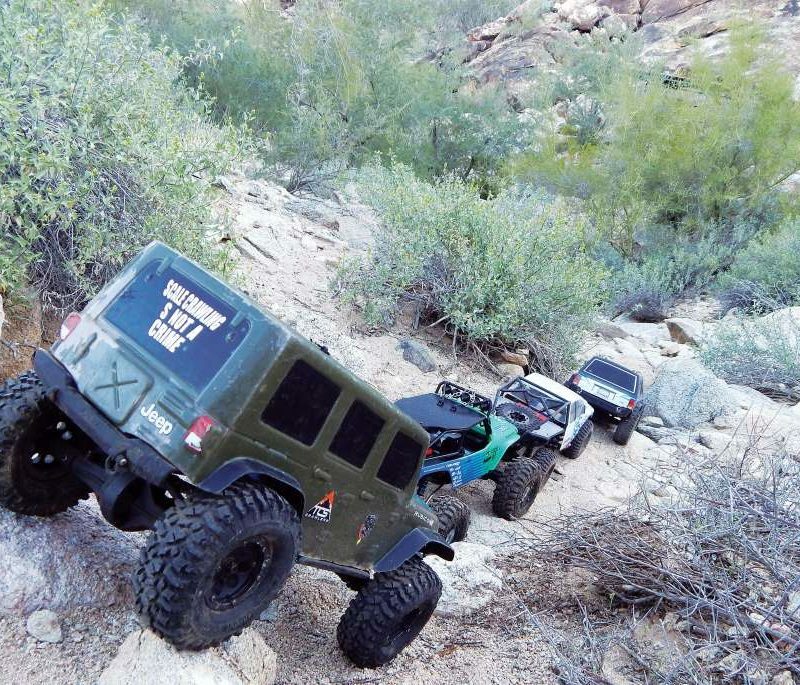 These vehicles have insane amounts of power, extreme tires, and a free flowing suspension to handle all of the rough stuff. This build would be nothing without the awesome Baja body from Pro-Line, and when I saw the body it gave me the idea and motivation to do this project. It looks absolutely killer and really fits the bill perfectly. This tough body mounts right into the stock body mount locations with no modifications necessary and I built super tough. It even comes with a spoiler for added down force and a detailed engine bay that was fun to paint. I ended up ditching the spoiler which allowed the engine to be more visible and looked that much better on the sand. I really like how the stock Slash suspension travel looks right at home with this body. While the Baja body is important for the build, the most functional component would obviously be the tires. They are what is responsible for connecting your buggy to the sand and the stock tires will get you nowhere in this regard. 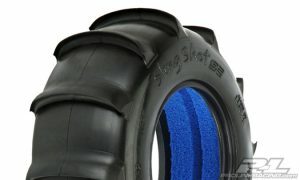 The first thing I looked for were massive over sized paddle tires, and sure enough Pro-Line offers the aptly named Slingshot SC tires. 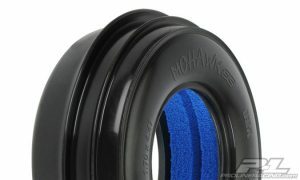 These have massive scoops that will throw the largest rooster tail and get your vehicle moving forward with ease. The idea with the front Mohawk tires is that they need to cut into the sand and guide the truck along the desired path. You do not want any forward resistance and a contact patch for the lateral motion which is why you see the unique stripe down the tires. It is a clever design that worked perfectly for me out on the beach and gave me surprising amount of control in the loose environment. You wouldn’t be wrong in calling it a day with just the wheels and tires, the buggy performs very well with just those upgrades. I decided to go a step further with a couple of add ons. 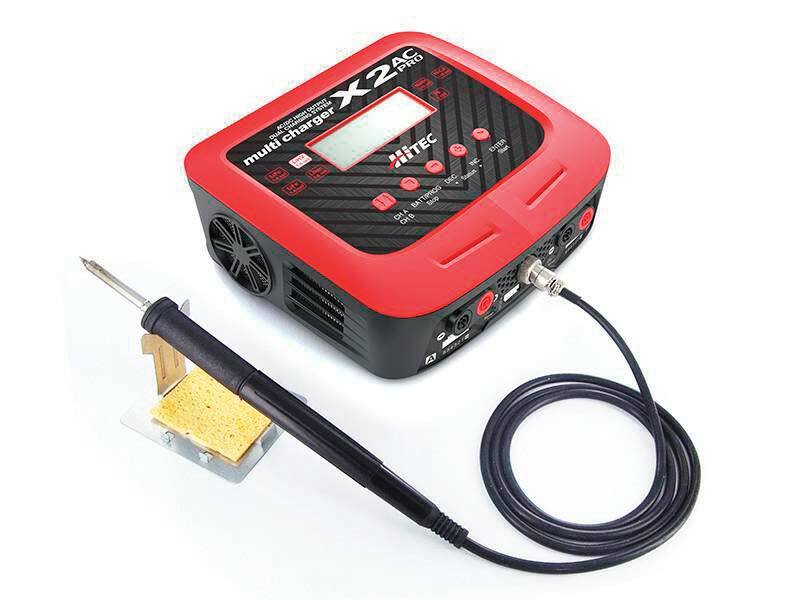 First, I would definitely recommend using your favorite brushless system. With so much sand being flung, the Slash is not very efficient on the sand now, so excess power is required. Something that is worth looking into is Pro-Line’s front bumper. It is a much simpler design than stock and I think looks a lot cleaner when paired with the Baja body. Out on the beach you do not need as much front protection, so the large over sized truck bumper looks a little out of place. This mod is so inexpensive also and is more race oriented than the stock setup, so it will be versatile for many future projects if you switch Slash setups then. I was inspired by one of Greg’s recent posts (link) in which Pro-Line walks you through how to make your Slash more of a monster out on the track/field. I thought that was a great idea, but something was missing to me and that was the scale look of an actual truck. So since the build is pretty well thought out already, all we have to do is make sure that our Slash looks the part. In case you did not watch the video let me give you a quick refresher. It could not get any simpler than this. 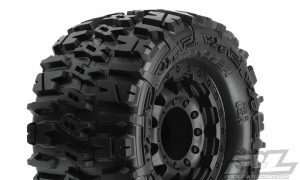 Since the Slash and Slash 4X4 is already compatible with basically any 2.8” wheel and tires for other Traxxas vehicles, we have tons of choices. Pro-Line went with the tried and true Badlands setup on a classic black multi spoke wheel. 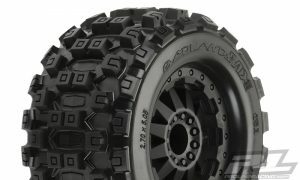 I really like the Badlands tire and they have been around since I started bashing so I know that they work so well under basically every condition. They also have a great tread life so you don’t have to worry about these wearing out too quickly. They also have a really aggressive off-road look, perfect for our truck. I really could have gone with any of the pickup truck offerings from Pro-Line for this build, but the Chevy stuck out as being a great looker for the jacked up monster truck. It looks pretty killer on SC type wheels, but really pops on the Stampede style wheels and tires. It has plenty of scale details that match the real thing, so if you decide you want to keep things more realistic, there are plenty of Pro-Line accessories to add for looks (and as mentioned the SC tires/wheels look more scale). 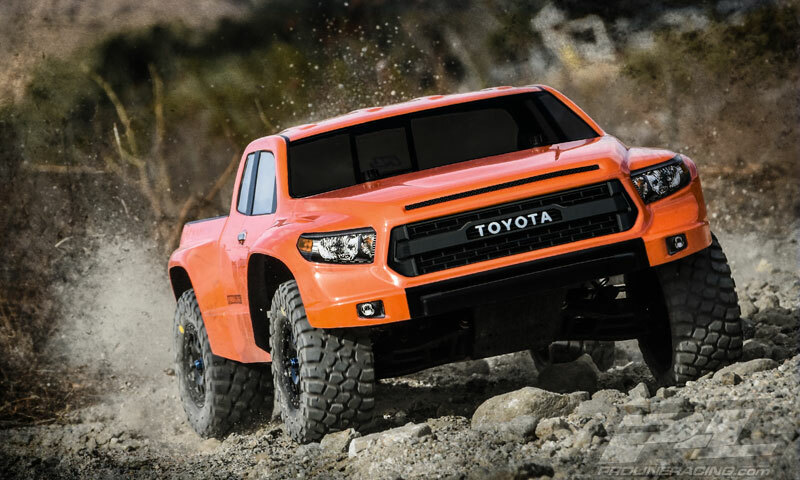 Another added benefit of this body is the extreme durability you get with Pro-Line accessories. I remember back when I was racing Slashes I was always amazed at how long they lasted, it wasn’t uncommon for one to last multiple seasons! 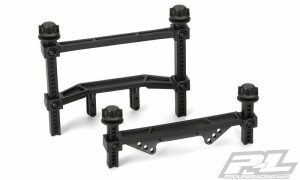 Just like the Desert Eagle body, be sure to pick up he extended body mounts as the Chevy body needs this on both the Slash 2WD and 4WD. I think the front bumper that Pro-Line offers is a borderline necessity as well, since it fits so well with the Chevy body. 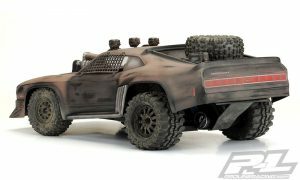 Even though this is more of a monster truck then a scale rig, it would be a crime not to mention the scale accessories that can help bring this Slash creation alive. 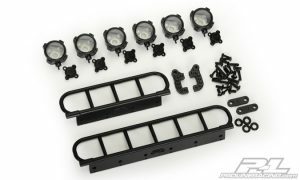 From the lighting standpoint, you have to love the light bar kits for off road lighting. 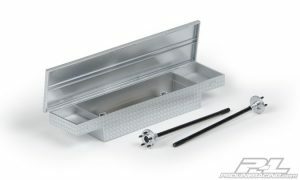 The 4” version would sit perfectly on top of the Silverado body. But why stop there, there are plenty of scale add-on kits for sale. I picked 2 out that I thought would fit the pickup truck look, scale accessory assortment #4 and #8. 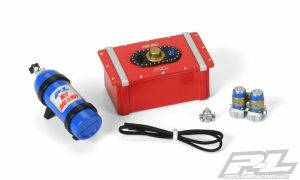 #4 is a tool box replica and #8 has a fuel cell and nitrous bottle for that extra level of ridiculousness found on monster trucks. 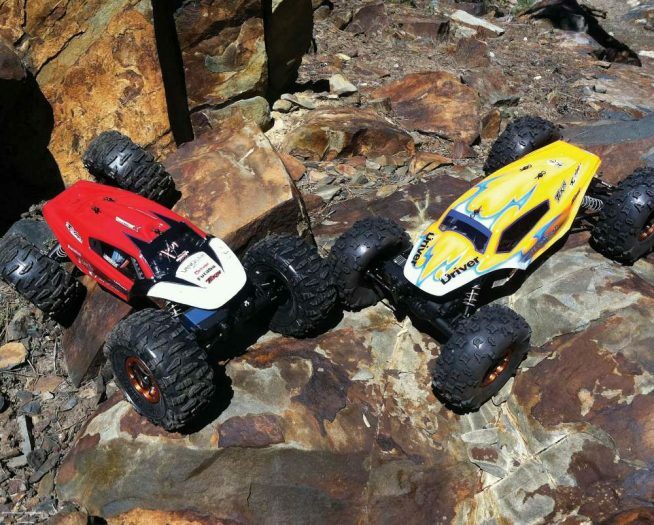 These are just the tip of the icebergs when it comes to Pro-Line offerings on the Traxxas Slash. I myself have done the dune buggy conversion and I love that I can change up the vehicle so drastically with minimal time and money invested (much less than a new vehicle). So dust off your Slash and give it a new lease on life. Check out RC Driver’s Facebook page soon I will get out my old Slash VW and post some pictures of my build! Next Simple RC Body Painting Tips & Tricks!